EPF or Employee Provident Fund is a Government-initiated post-retirement savings scheme that is accessible to all the salaried employees. The Employees Provident Fund Organisation of India (EPFO) manages the EPF. According to the EPF and Miscellaneous Provisions Act, it is mandatory for all registered organizations with more than 20 employees to enroll with the EPFO. Employee Provident Fund is considered to be a great savings platform, which aids the employees in saving a portion of their salary each month. EPFO has recently launched the facility of E-nomination on their Unified Member Portal. This service assists all EPFO subscribers in enrolling a nominee for their EPF account. Moreover, subscribers who wish to modify their existing nomination can also utilize this facility. Earlier, the process of changing EPF nominee was a highly tedious task. Prior to the launch of this digitized service, the procedure was entirely offline, and it was quite a lengthy and cumbersome one. It required the subscribers to obtain FORM 2 for enrolling a nominee. This form had to be filled up and submitted to the employer for authorization. The employer would have to send the Form to the EPF office. The process was entirely manual and highly time-consuming. The new e-nomination facility is not only much faster, but it also eliminates the employer’s intervention. A substantial amount of your life’s savings are deposited into your EPFO account. It is always safe to assign a nominee for the account. If something unfortunate happens to you, your family can largely benefit from your savings corpus. Registering a nominee is imperative as it considerably reduces the complications of claims and ensures smooth transactions. 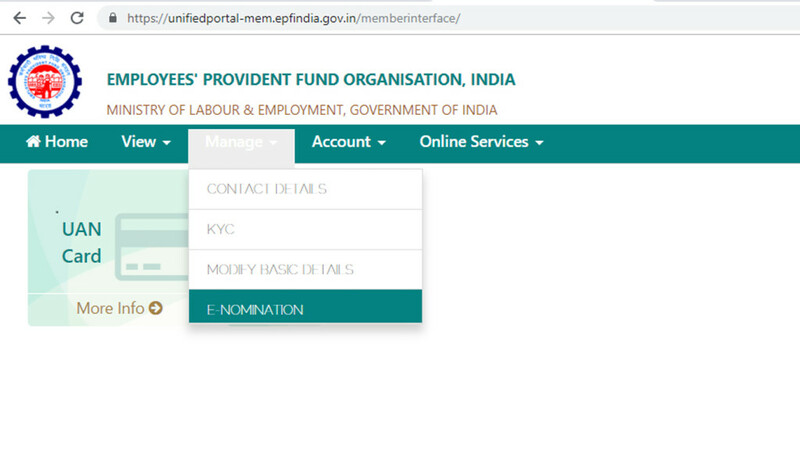 Let us take a look at the step by step procedure of using the E-nomination facility of EPFO on its Unified member portal. #2 Go to the panel on your right and login using your EPFO login credentials – UAN and password. 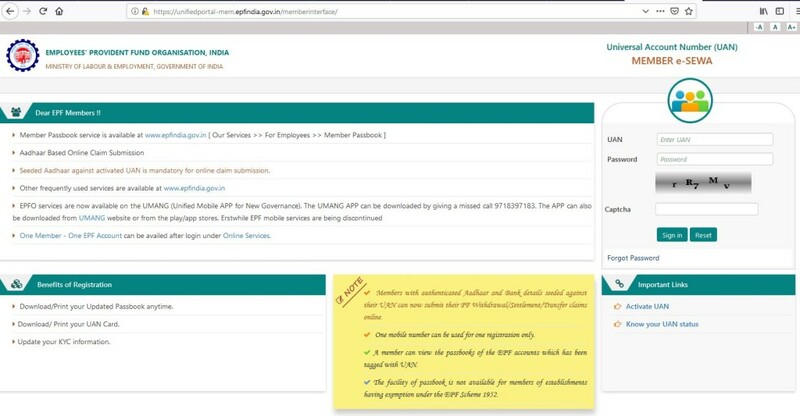 If you haven’t yet activated your UAN on the EPFO portal, just click on “Activate UAN” option found right below the login panel and register for the services. This will also allow you to check your EPF balance. #3 Go to the “Manage” option and click on ‘E-nomination’ to proceed to the “Profile” page that displays your UAN number along with your name, date of birth and gender. #4 Enter your Permanent Address in the box and click on the “Save” button. Remember that this will work only if your Date of Joining the EPF Scheme is registered with the EPF account. If not, you will not be allowed to update nomination details. #5 Once your profile details are updated, you will be asked to fill in the family declaration. #6 If you select the “Having Family” option, you will be asked to enter your family details. Feed the name, date of birth, address of the family member and then select the relationship with the concerned person from the drop-down menu. Click on the “Save Family Details” button. #7 The next page is dedicated to EPF Nomination, where you will be allowed to select the family members whom you wish to nominate. You can specify the proportion of share that you want to allocate to each nominee. You can modify the names of the nominees and also adjust the percentage of amount that they are nominated for. #8 Click on the “Save EPF Nomination” button to save the entered details. #9 The next step would be to approve the nomination by using the ‘e-sign’ feature. #10 Click on the ‘e-sign’ button. A popup window will ask for the signatory. Select the signatory and then click on the ‘Generate OTP’ button to receive an OTP on your Aadhaar-registered mobile number. #11 The consent through OTP will automatically authenticate the process without the need for generating any additional Digital Signature Certificate. #12 Once you enter the OTP, the nomination for your EPF account will be registered successfully. The launch of the e-nomination facility for EPFO is indeed a progressive step towards digital India. The facility is extremely convenient and hassle-free. It aims to ease out the difficulties that subscribers faced earlier in getting such things done manually. Gone are the days of frequenting the EPF office and waiting in long queues for hours to get a simple job down. You can simply log on to the EPFO portal and register or change the nominee from the comforts of your home. So, if you haven’t updated your EPF nominee details yet, what are you waiting for? Just get in front of the computer with your UAN and your registered phone and get it done in a jiffy.